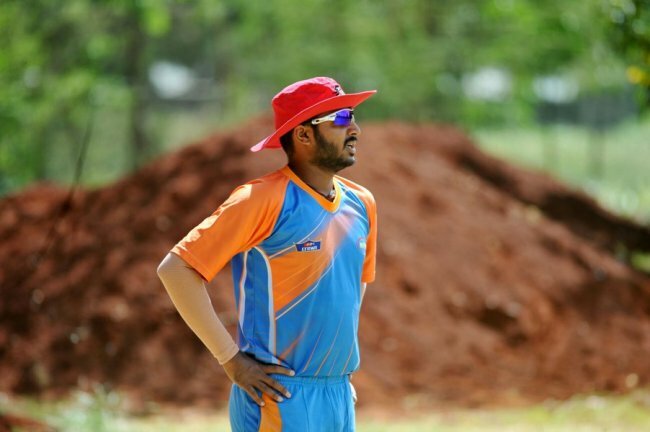 Kenya captain Rakep Patel offered no excuses following his side's heavy defeat by Scotland in their last match of the ICC World Cricket League Championship on Friday. In pursuit of 266 for 8, Rakep led side was bowled out for 105 to loss by 161 runs at Dubai International Stadium. It was Kenya’s second loss to the Scots after having gone down by the same team by eight wicket by the same team on Wednesday. Rakep said the conditions were not to blame, calling on the players to be consistent. "We have been playing good cricket but we have been failing on consistency. We just need to be consistent. I believe that if we improve on our consistency we will be winning more games. The ones who are getting runs aren't getting enough and those who aren't getting runs are not getting anything at all," the captain asserted. With the loss, Kenya ended the championships in the fifth place with six wins from 14 matches. A captain’s knock from Kyle Coetzer (130-ball 121) was backed up by an incisive bowling performance as Scotland completed a dominant win over Kenya who had only the last ten overs of the first inning to look competitive. Kenya's suspect batting which has been the main problem during the whole campaign re-surfaced with only some players scoring 30 runs and the rest failing to make a mark in the inning. CB Sole tore through Kenya’s middle order, as Scotland bowled Kenya out in 33.2 overs. Kenya was left ruing its decision to field first, as Coetzer, the opener, was in good nick, even as wickets fell around him. Coetzer finally found a steady ally in Craig Wallace. The fifth-wicket pair added 87 before Wallace fell for a run-a-ball 49, which included one hit over the fence. Michael Leask provided a final boost with a belligerent 23 off 11 balls. Once again a change in the batting line up by the Kenyan coaches didn’t work out as Gurdeep Singh who was promoted to the opening didn’t trouble the scorers. Rushab Patel and Dhiren Gondaria could only put on 24 in their 4.2 overs before Rushab was sent back to the pavilion to complete another poor show with the bat. From 28 for 1, Kenya lost five wickets including top scorer Dhiren Gondaria (38) for 19 runs to be stand at 47 for 6 after only 12.2 overs. Things could have been worse for Kenya had Emmanuel Bundi and Shem Obado not showed some resilience in their 10 overs stand that yielded 32 runs to lift Kenya towards the 100 mark. After Bundi was caught out, Obado and Lucas Oluoch managed to get Kenya past the 100 mark and to the final total of 105 as Obado remained unbeaten on 33. "We showed some glimpses throughout the championships that we could play, but we've been losing wickets in clumps very consistently and that's not good enough," said a blunt Rakep at the end of the loss. "We have always hoped that the top four can to stand up and really take control. But we are not doing it consistently enough. We are not giving ourselves the chance to really go hard at the back end of the game and getting partnerships in the middle, something we need to look at." Sole finished with 4 for 24, while Evans had 2 for 18 and Sharif 2 for 20.